Today’s post is the third and final in our Let’s Remember Together series. Three days, three names chosen at random from the diary pages, the beginnings of three Life Stories. Today, I’ve been researching Private A. Morrall, mentioned in the diary of the 1st Battalion King’s Shropshire Light Infantry. You can see the diary entry by clicking here. 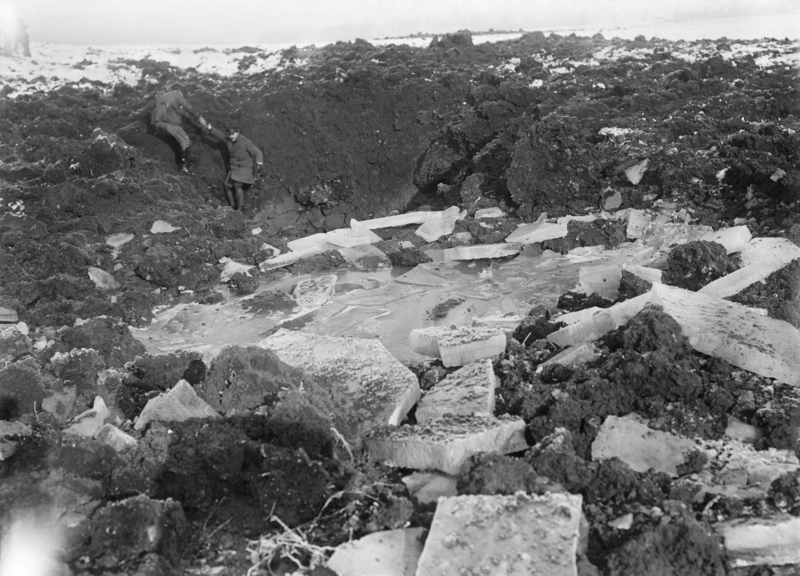 Image © IWM (Q 1684) – Officers inspecting chunks of ice broken up by shell fire on the battlefield at Beaumont Hamel, December 1916. Private Morrall is included in a list of NCOs and men recommended for the Military Medal for gallantry. His service number is 8196. Further research on Lives of the First World War tells us he was Alfred Edward, a career soldier. He enlisted in the Army on the 30th of August, 1906. The 1st Battalion of the King’s Shropshire Light Infantry deployed to France at the outbreak of hostilities in 1914 and remained on the Western Front all the way through the conflict, making Private Morrall one of the ‘Old Contemptibles’ of the British Expeditionary Force, apparently derided by the Kaiser. He was discharged on the 28th of May, 1917 because of illness. Beyond that, details are sparse. Why not have a look at his Life Story and see if you can add to it? I hope this series has shown how Operation War Diary and Lives of the First World War can be used together to breathe life back into the names we uncover on the diary pages. We hope eventually to feed the data generated by Operation War Diary into Lives, to allow evidence from the diary pages to be attached directly to Life Story pages. I’m looking forward to building up a more detailed picture of the names I’ve encountered over the last few months – Captain Swaine, who thought his Cyclist Company might have fired the first shot on the Western Front, Sergeant Lowe, who led a party of the Durham Light Infantry into enemy trenches and Rifleman Bajbir Rana, of the 1/1st Battalion Gurkha Rifles, who volunteered to go out into no-man’s land on the 16th of February, 1915, to scout enemy positions. I can’t pretend that doing this work makes me any more capable of understanding the hardships and horrors they must have endured, but I feel it’s valuable nonetheless. In tagging their names, our Citizen Historians are ensuring that they do not become lost in the pages of history. In building up details around them, we can see them as real people once again, people just like us, who because of time and situation were thrown into a conflict that devastated a generation. So many of them were lost on the journey through, and yet in some small way we can now make sure that loss is not forgotten.